Scientists have discovered about 400 previously undocumented stone structures known as 'Gates' in Saudi Arabia with the help of Google Earth image. While Saudi Arabia is largely thought of as barren mountains and desert, it was also home to an immense number of archaeological sites that were yet to be identified, recorded and mapped, said David Kennedy, researcher at University of Western Australia. "You can not see them in any intelligible way at the ground level but once you get up a few hundred feet, or with a satellite even higher, they stand out beautifully," Kennedy said. 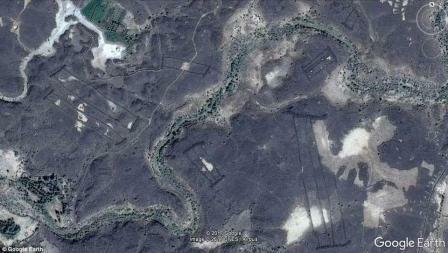 The structures look like flat field gates from top in the images obtained from Google Earth. "I refer to them as Gates because when you view them from above they look like a simple field gate lying flat, two upright posts on the sides, connected by one or more long bars," he said. They do not look like structures where people would have lived nor do they look like animal traps or for disposing of dead bodies. It is a mystery as to what their purpose would have been, researchers said. Since 1997, Kennedy has flown in helicopters over Saudi Arabia's neighbour Jordan, photographing tens of thousands of stone-built structures scattered over its lava field or 'harrat'. Shapes range from giant circles of stone that may be 400 metres across to kites that may have been used as animal traps, pendants used as funerary monuments, and many more. They are believed to be the ancestors of the modern-day Beduin in the region who describe them collectively as 'The Works of Old Men', they added.